Jonah was in dire straits in the belly of that big fish. In an attempt to disobey God and run away, Jonah ended up as fish-food. Realizing the seriousness of his plight, Jonah did the only thing he could do: pray. God was the only one who could save him, so Jonah called on him and God heard. 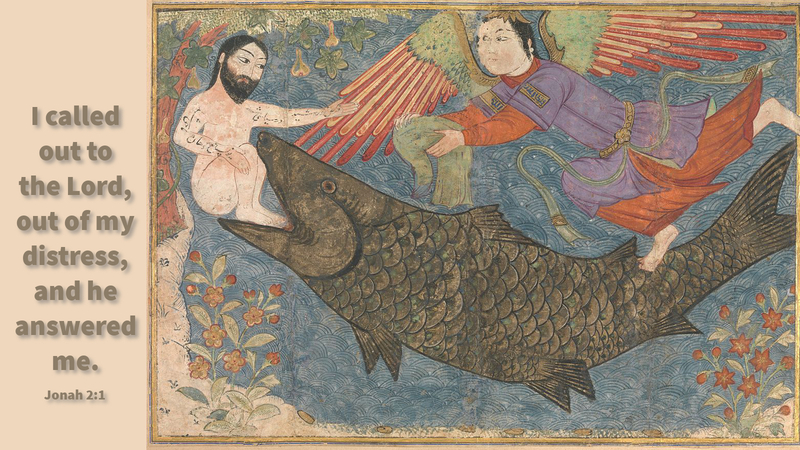 He commanded the fish to transport Jonah back to dry land and it did. Jonah deserved death, not deliverance; even so God rescued him by miraculous intervention. God does the same for us. When we are disobedient we often bring troubles upon ourselves. Even so, God offers us deliverance through his Son Jesus. In the waters of Holy Baptism God washes us clean of our sin and makes us his children. Now when the trials and tribulations of life overwhelm us and we feel swallowed up, we can cry out to God who gives us relief. Today people are constantly swallowed up by life. Overwhelmed by work, school, family and health problems, people try to escape in a variety of ways, many of them not good. God alone can deliver them. We have the Word, let us be faithful to share it. Prayer: Lord Jesus, when life overwhelms us grant us faith to cry out to you. Amen.